Born on the Island of Ischia, Southern Italy, 1654; d. 5 March, 1739. 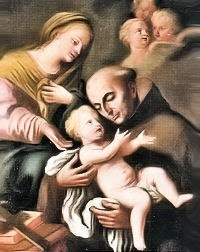 From his earliest years he was given to prayer and virtue. So great was his love of poverty that he would always wear the dress of the poor, though he was of noble birth. At the age of sixteen years he entered the Order of St. Francis at naples, amongst the Friars of the Alcantarine Reform, being the first Italian to join this reform which had been instituted in Spain by St. Peter of Alcantara. Throughout his life he was given to the greatest austerity: he fasted constantly, never drank wine, and slept but three hours each night. In 1674 he was sent to found a friary at Afila, in Piedmont; and he assisted with his own hands in the building. Much against his will, he was raised to the priesthood. As superior, he always insisted upon performing the lowliest offices in the community. In 1702 he was appointed Vicar Provincial of the Alcantarine Reform in Italy. He was favoured in a high degree with the gift of miracles, people of every condition being brought to him in sickness. His zeal for souls was such that even in sickness he would not spare any labour for them. His great devotion was to our Blessed Lady, and he was urgent with his penitents that they also should cultivate this. He was beatified in 1789, and canonized in 1839.